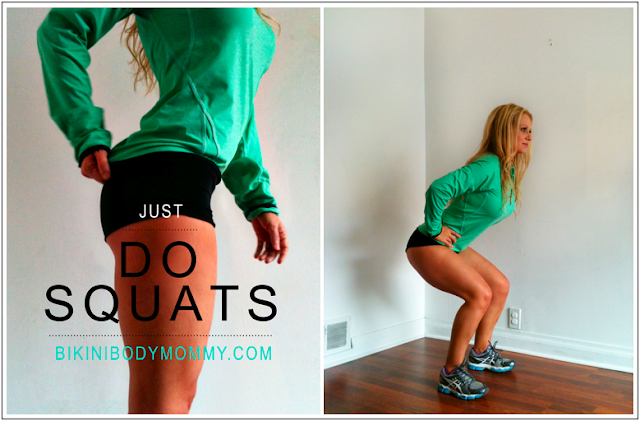 BIKINI BODY MOMMY™ — JUST DO SQUATS? Think about how many times our bodies execute this movement on a daily basis ladies. We squat to sit down in a chair. We squat to lift our kids out of the tub. We squat to go to the bathroom. We squat to get in and out of our cars. We squat to pick up toys off the floor -- or at least we SHOULD BE, instead of just bending over! Squats are one of the most functional movements our body performs on a daily basis, and yet most of us are doing it incorrectly. IT'S TRUE. We have lost our ability to squat. Why is this? Because the age old adage, "use it or lose it!" is TRUE, and the muscles in our glorious female badonkadonk's have forgotten how to activate properly in order to squat down. The more inactive we are, the tighter our bodies become. This leads to altered muscle length-tension relationships, which results in bad movement patterns. In layman's terms? Our muscles have plain FORGOTTEN how to move properly. 1. Start with your feet shoulder width apart, toes facing forward. I want you to place your hands on your hips and pick a focal point that is eye level directly in front of you. 2. As you bend your knees, I want you to place your weight in your heels and sit back as if you're going to sit in a chair. Your chest is up, head is up, hips are back, weight is on your heels. Most of you are going to get your thighs almost parallel to the ground. And here, I want you to pause for about 5 seconds. 3. To return back to the start, you are going to press though your heels as you come back up to standing. Straighten out your hips, standing up -- nice and tall. And THAT ladies is the perfect squat! If you seem to be having trouble executing the squat, it is very likely due to some lower back and/or glute weakness. A couple of exercises that you can do to strengthen these muscles are: "bridges" (to strengthen your glutes), and "Superman's" (to strengthen your lower back). Try to perform 3 sets of 15 reps to perfect your form. QUICK QUESTION: What other exercises and "how-to" tips would you like to see featured? Leave a comment below. Also, make sure you are FOLLOWING ME on Bloglovin so you don't miss future posts just like this one!